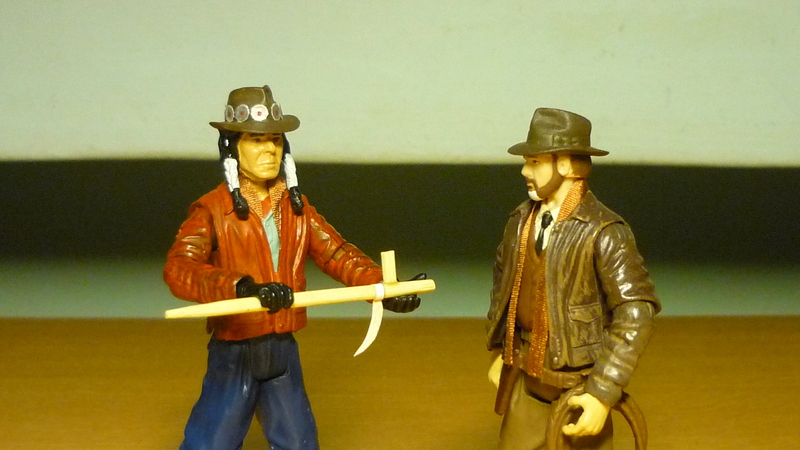 Yeah I’m back, let’s get on with showcasing my latest custom Indiana Jones figures. In 1950, Indiana Jones was in Wyoming, where he helped his friend, a native American named Greycloud, prevent a valuable artifact from falling into the hands of pursuing mobsters. During a heavy snowstorm, Indy and Greycloud took shelter in an abandoned cabin, in which Indy found a saxophone, and he was thereafter inspired to tell Greycloud about his passion for jazz and his close encounters with the mob while working and studying in Chicago in 1920. 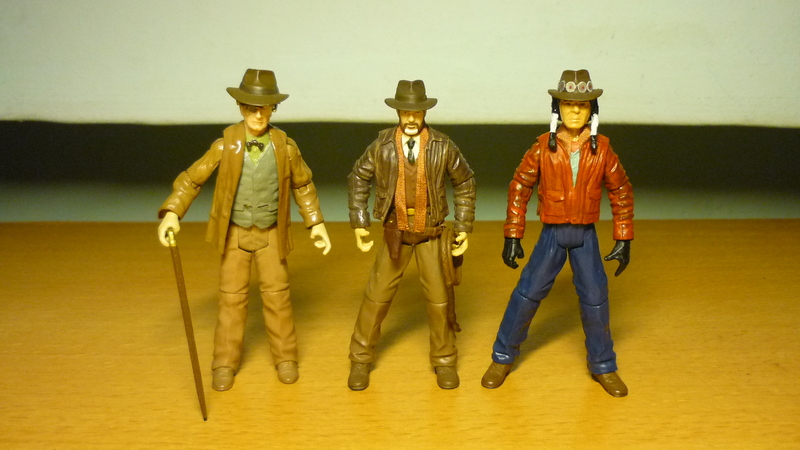 When “The Young Indiana Jones Chronicles” returned for its second season in 1993, in an attempt to boost ratings George Lucas reshot the bookend scenes for “Mystery of the Blues”, replacing the original Old Indy bookends with new scenes starring Harrison Ford as the titular Indiana Jones (Click here, the Youtube link to Harrison Ford’s scenes). For many Indy fans, it was an exciting occasion as it marked the first time since the release of “The Last Crusade” in 1989 that Ford returned onscreen as the famous adventurer archaeologist. In addition, Ford had a beard during the reshot as he was then also filming his scenes for “The Fugitive”. As a result, Indiana Jones had a real badass look with his beard and his appearance left quite a memorable impression among fans. 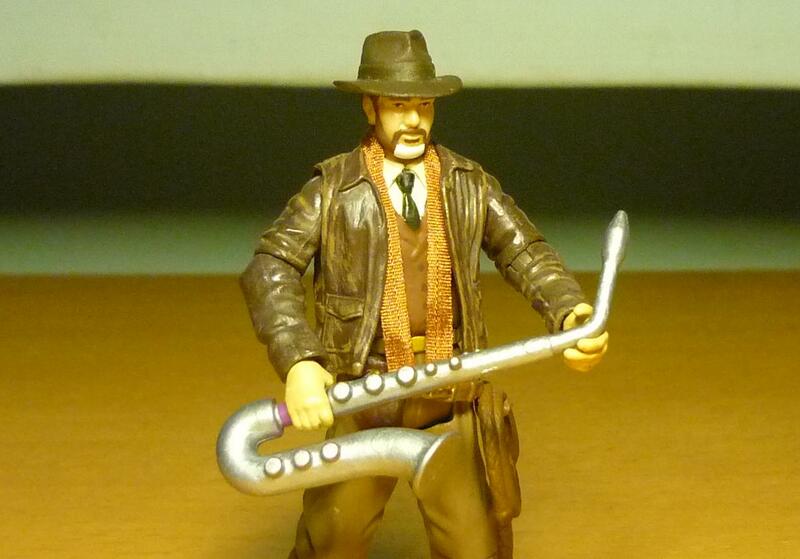 Thus when the recent wave of customising Indiana Jones figures began, among the many custom figures showcased by fans on Indiana Jones forums include the bearded Indy from “Mystery of the Blues”, and likewise I too have thus been inspired to create one of my own. Work on the figure included dremeling the lower half of the tie so that I could use epoxy to sculpt the vest, as well as sculpting a beard for Indy. The vest and beard were thereafter painted, and a brown ribbon serves as Indy’s scarf. For some reason Indy didn’t bring his satchel with him when he was in Wyoming (but he did have his gun holster and whip, … and a present-day walkie-talkie if you noticed hard enough). In 1950, Greycloud sought help from his friend, Indiana Jones, to prevent an ancient Peace Pipe from falling into the hands of some mobsters who were intent on stealing it. According to Greycloud, the Peace Pipe was the most sacred relic of his people’s past. Despite Indy’s confidence at shaking off the mobsters while they hid in the cabin during the snowstorm, Greycloud nonetheless remained worried that the mobsters will still find them. True enough, the mobsters turned up at the cabin, and after a brief scuffle their leader got hold of the pipe. Fortunately, Indy invoked the power of another “sacred relic” to subdue the mobsters and reclaim back the Peace Pipe for Greycloud. 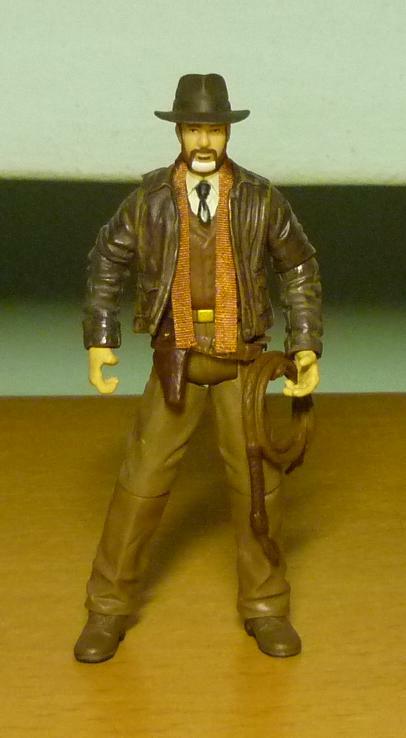 Most parts of Greycloud came from a typical jacketed Indiana Jones figure. The torso was trimmed such that the jacket can be fixed in a fastened position. Indy’s hat was transplanted onto the head, the disc decos on the hat were punched out from paper, and similar to Indy a brown ribbon serves as Greycloud’s scarf. Greycloud assembles the Peace Pipe and shows it to Indy. 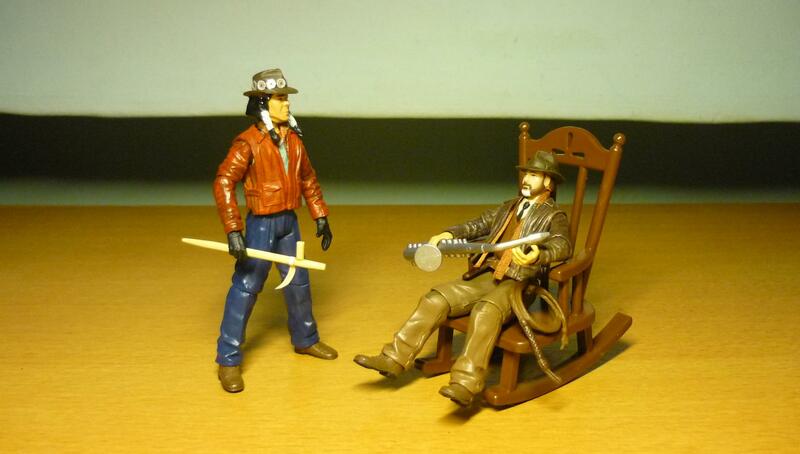 Indy relaxes and tells his jazz story to Greycloud. 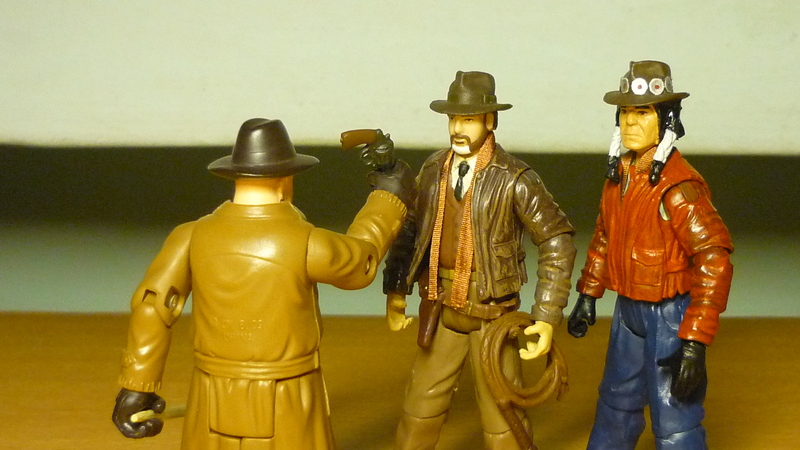 The mobster steals the Peace Pipe and whacks Indy with his pistol. One of the wacko theories posted on the Indy forums suggests that the Mr. Bad Guy who steals the Peace Pipe could have been Harold, a waiter who worked at the same restaurant where Indy was also working as a waiter at in 1920. This was based on a passing remark made by Harold during the show, about using a big fat tip he received to buy land in Wyoming. The forum post then goes on to suggest that Harold the waiter eventually became a land baron in Wyoming intent on plundering any historical artifacts found on his land, including the Peace Pipe. Another theory says that the saxophone Indy found in the cabin was the same saxophone that he was playing back in 1920. The original bookends for “Mystery of the Blues” starring Old Indy can be found on Youtube, here. In fact, all the other Old Indy bookends are also on Youtube and you can easily find them. A special mention about a couple of other items that appeared in the above pictures. The “Peace Pipe” was made from toothpick and paper. 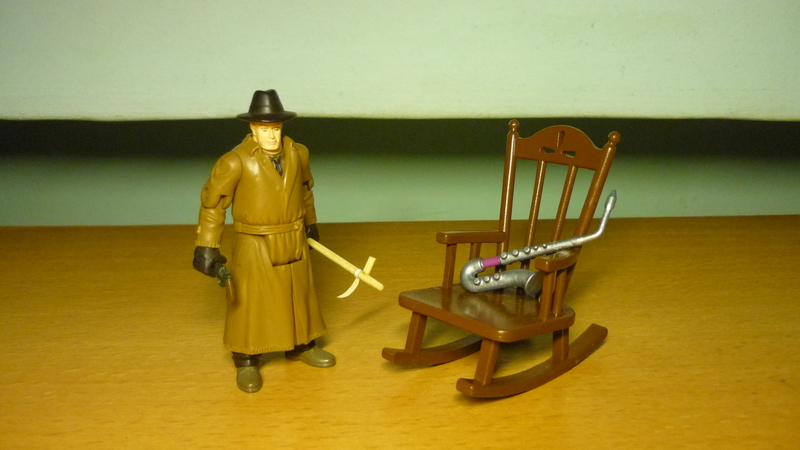 The saxophone came with this Stikfas figure. The rocking chair belongs to this brand. And that trenchcoat mobster? 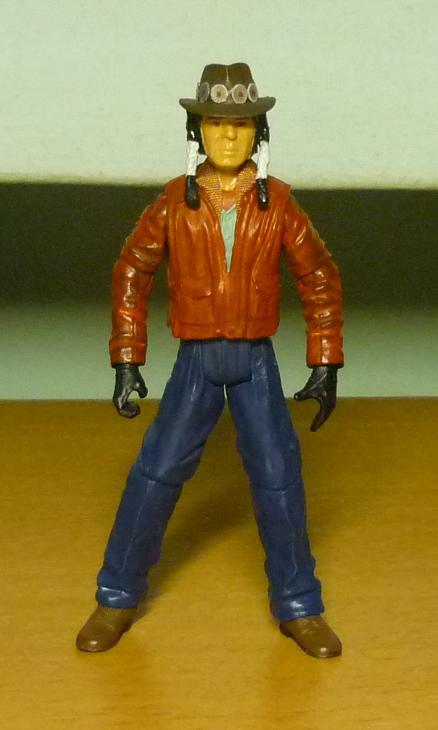 He’s a Ben 10 character named Validus, just one of many figures compatible with my Indy figures that I had acquired.